You have added Back Trail Anarkali with Raw Silk Lehenga & Pants in Powder Pink Net with Zari Embroidery to your Shopping Bag! Slay it in this designer party wear outfit and be the slay queen! 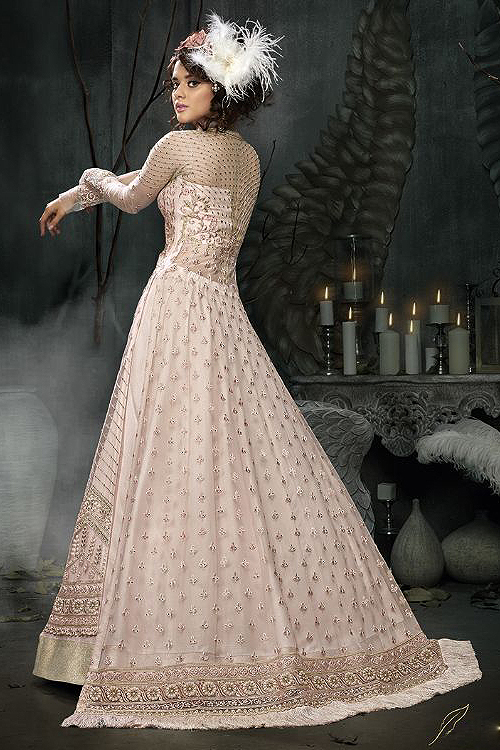 The side slit back trail anarkali top features all over rich zari and thread embroidery with stone work. The anarkali kurti’s frilled sheer neckline along with sweetheart bodice looks amazing. This party wear ensemble can be worn in two ways – either with embroidered raw silk pants or raw silk lehenga. The unstitched pants features embroidered net at the bottom while the raw silk lehenga is bordered with golden lace at the hem, giving the outfit a layered effect. Matching net dupatta with butis and lace border completes the look. To get party ready, accessorise your look with a floral head piece, you can add feathers for over the top look. Carry a designer clutch with sling strap and turn heads wherever you go.